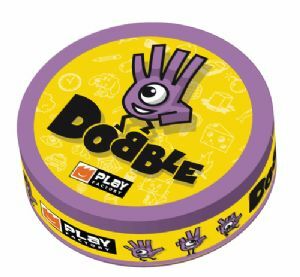 Dobble is a visual perception card game in which players race to find the one matching picture between one card and another. The pictures can be different sizes. The cards are round and feature an assortment of colorful images of items like insects, plants, symbols, and smiley faces. Every card is unique, and has only one picture in common with each card in the deck. The game is very portable and includes a deck of 55 cards in a container that is the same size as the cards. Make a splash with this durable and waterproof version! Play at rhe beach, by the pool or on your next outdoor adventure! Each card has one animal in common with the other cards, be the first to spot the animal and claim the card, fun and easy for all ages.